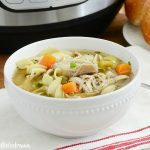 Easy Crock-Pot Chicken Noodle Soup is made entirely in the slow cooker so that you can enjoy a bowl of homemade comfort food without all of the work! Is it possible to have too many slow cookers? I kind of doubt it. I have a small one, which is perfect for holding dips and appetizers, especially on game days or parties. I also have 4-quart slow cooker, which I got for practically nothing on Black Friday — score! But the slow cooker I use the most is definitely the 7-quart one. I use this for soups, stews, roasts and our favorite holiday hams. I’ve even made peach cobbler in the Crock-Pot. So when my favorite small appliance broke down, we pretty much ran out and bought a new one right away — gotta love those holiday sales! Just in time, because my little boy came down with his third nasty cold since school started, so I made a big batch of chicken noodle soup in the Crock-Pot. A long time ago, in a galaxy not that far away, I used to make homemade chicken soup completely from scratch, on the stove — just like my mom and her mom and her mom’s mom did. Chicken soup and I go waaay back. It’s amazing stuff, but it takes a lot of time. So, this slow cooker soup is a lot easier and honestly tastes just as good. And if you have the basic ingredients on hand, you can throw this soup together in a pinch. I usually always have frozen chicken breasts on hand, so that’s what I normally use. If I plan ahead, I’ll pick up fresh chicken the night before. And during soup season, I also stock up on organic chicken broth and the other ingredients. It makes life a LOT easier! Making the soup is super simple — couldn’t resist saying that! There are tons of recipes for Crock-Pot chicken soup, but mine is slightly different. I like to let the chicken cook by itself first and then add the broth. It’s just a personal preference. If you want, you can add the chicken and broth at the same time. About an hour before you’re ready to eat, just throw in some egg noodles or your favorite pasta, and when they’re soft, you’re ready to eat. 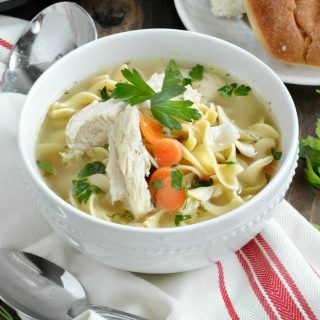 Serve the chicken soup with some rolls, crusty bread or crackers, and you’ve got yourself one comforting meal! 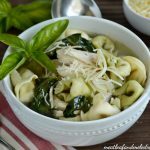 My family loves this Easy Crock-Pot Chicken Noodle Soup, and I love having the leftover soup for lunches. 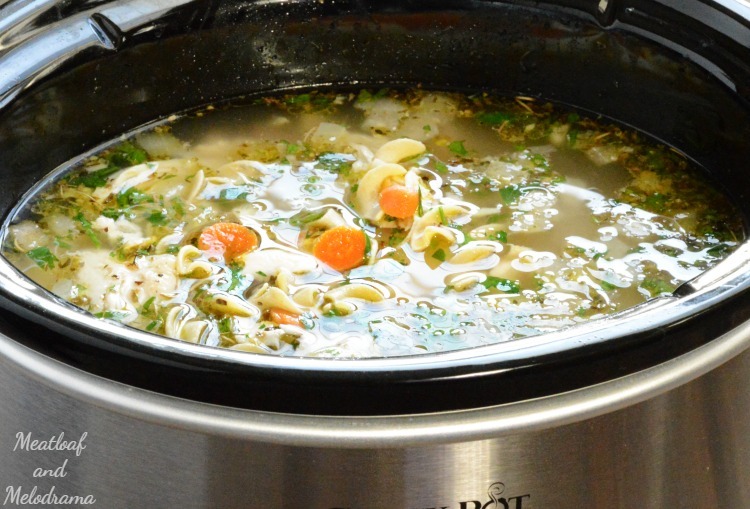 Have you ever made soup in the slow cooker? I have two slow cookers and they’re great for soup or chili parties. Now I want to make a big batch of this chicken noodle soup! I can never have enough slow cooker recipes! This soup looks delish! Thanks, Jessica. My family just loved it! Chicken noodle soup, yummy! Will have to try this recipe. 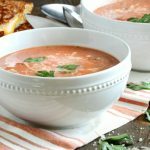 This is my favorite soup to make when we are feeling under the weather. So so good! I was so tempted to get a small dip slow cooker the other day and I though I should just be happy with the one larger one I have. Now I’m going to put one on my Christmas list knowing it’s fine to have more than one! 🙂 Love this soup idea!!! 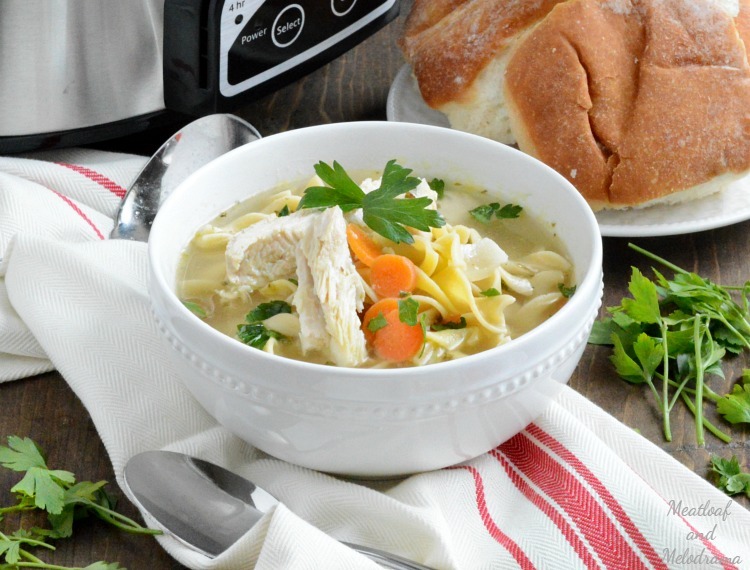 I am not going to wait until I have a cold to try this chicken noodle soup – it looks too good to wait! There can never be too many slow cookers in the house! My sister in law us to have like 5 running at a time for dinner at her house! She loved them! 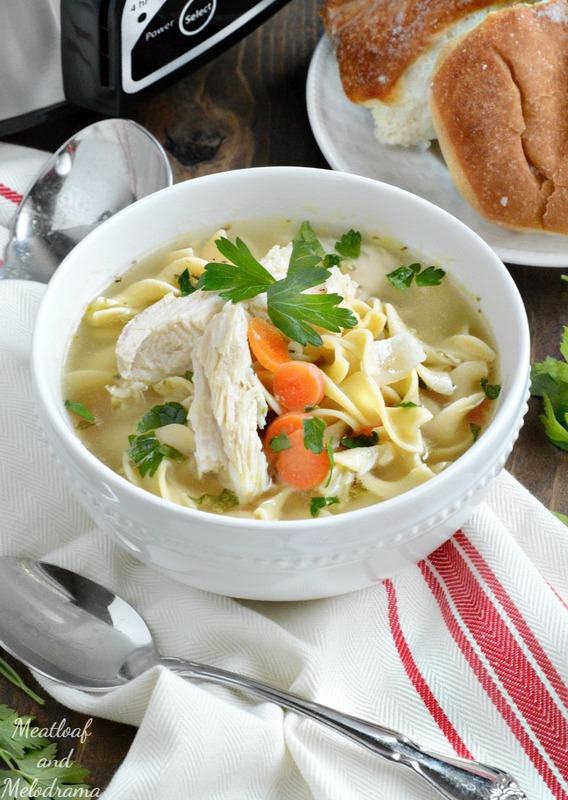 Perfect chicken noodle soup recipe! 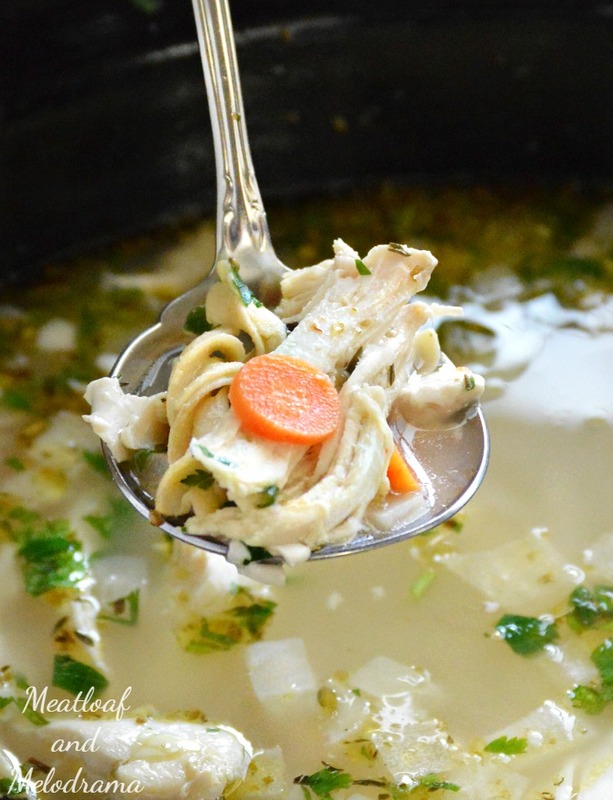 There is really nothing better than a great bowl of Chicken Noodle Soup, this looks amazing! We really appreciate you sharing with us at Full Plate Thursday and hope you are having a great day! My preschool class when we read Stone Soup. Can I add potatoes and corn too? Thank you! !